You know that moment when Bowie died that you realised time was split into two: pre-Bowie and post-Bowie? I just had that feeling on hearing about the death of Talk Talk's Mark Hollis. Not that it's a choice between them, of course. It's weird, isn't it, how these strangers affect us so much, especially a stranger who was unlikely in any case to ever produce music again. Talk Talk were one of the few 1980s bands who cut across the rave era into my 1990s brain. Scratch beneath the surface of the main singles It's My Life and Life's What You Make It, both of them whole loads of ace, and his talent shone brightly, albeit it awkwardly. What sad news (caveat: yet to be officially confirmed at the time of writing). Still, it does mean that in heaven right now, Mark Bell from LFO is making an experimental album with that incredible voice. Here are two bits of music. Firstly a 1986 performance, complete with strangely intense percussion break-down - and 1980s haircuts (apart from Mark Hollis, who was beyond time). And secondly an uncredited piano performance on Unkle’s Psyence Fiction, his notes as reclusively minimal as you'd think. 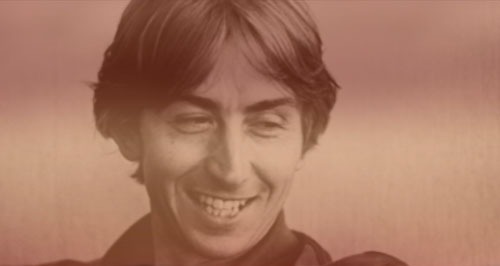 Pictured above: Mark Hollis superimposed on a background from the It's My Life video.